More than 200 retired staff-members of apex consumer cooperative body NCCF are running from pillar to post to claim their pension which is due to them and on which even the Supreme Court holds a similar view. In a detailed mail sent to Indian Cooperative these retired personnel have narrated their tale of woe detailing the step-motherly treatment being mated out to them by the current management. For their pensions to be made both respectable and regular, NCCF has to submit Form 3A to the Commissioner of EPFO. But NCCF is not doing so despite several reminders from the Commissioner office. S N Singh, who retired as the Branch Manager of NCCF from Chandigarh said that while the Dispatch Register shows that a letter from the EPFO was received on 30.5.2018 , the MD denies receiving any letter. “The fact of the matter is that Anil Bahuguna who was the then MD marked the letter to Mr Lanka, Manager Administration who did not pay importance to the letter”, a pained Singh added. The aggrieved ex-employees even sent the SC judgement buttressing their case. This was SC observation in Civil Appeal Nos 10013-10014 of 2016 (Arising out of SLP© No 33032-33033 of 2015) in R C Gupta and others Vs Regional Provident Fund Commissioner. “The Forms were submitted by almost all ex-employees to the NCCF sometime in January 2018. Thereafter, we have been pursuing the matter both by post and personal visits since that time with little result so far”, he underlined. Earlier, the NCCF management maintained that action would be taken only if EPFO directs NCCF. The employees promptly took up the matter with the EPFO which issued instructions vide letter No DLS/RO south/ Pension Section /Higher wages /821 dated 10.05.2018. “But still there is no progress”, said the victim giving minute details. The retired employees have made a whatsapp group to achieve the goal of regularizing their pension and in group of 10-12 they keep pursuing the matter from the NCCF office to EPFO. NCCF have just to forward the Forms along with a certified copy of Form 3 A of each employee from 1995 onward till the year of retirement, they say. . There was no financial involvement of NCCF but the EPFO would take further action only on receipt of the data from NCCF. The recent meeting of these staff-members with Shaukat Ali, the current Managing Director NCCF has excited some hope in them. A sympathetic Ali, as claimed by Singh, is said to have expressed paucity of staff to complete the assignment of filling up 3A Form of employees. “Many of us are ready to work free of cost in case additional manpower is required for the work”, S N Singh added. “Sir your portal is read by everyone in the cooperative circle; please help us by publishing our plight”, said Singh with a pain in his tone to this correspondent. “We have also met Chairman Vijender Singh at his home where he offered us milk and fruits and promised to look into the matter”, said Singh. These retired staff-members are indeed an unlucky lot as their career faced a situation few could imagine. The then Administrator Manoj Parida raised their retirement age to 60 years from 58 in 2014 but the same was brought back to 58 years in 2016 after the elected Board came to power. These men numbering 200 were made to retire when they had hoped to continue in job for another couple of years. And now this pension woes! Reproduced below is the copy of my mail sent to NCCF dated 17.06.2018 explaining the state of affairs. At the onset I and on behalf of my colleagues who incidentally were the senior most Ex Officials of NCCF would like to thank you for the patient hearing given on 5th June 2018, when we all came to visit you regarding forwarding of Forms released for revision of pension submitted to NCCF for onward dispatch to the EPFO along with Form 3A. Ø The Forms were submitted by almost all Ex Employees to the NCCF sometime in January 2018. Ø My Ex Colleagues have been pursuing the matter both by post and personal visits since that time. 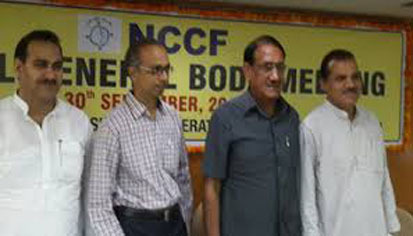 Ø Your Predecessor in one of the visits had informed that action would be taken only if EPFO directs NCCF. Ø The matter of issuance of instructions was taken up by the Ex Employees of NCCF and EPFO in response to the letter ( Copy of the same was submitted to office on 24.05.2018 by the Ex Employee ) , issued instructions vide letter No DLS/RO south/ Pension Section /Higher wages /821 dated 10.05.2018. Ø During the course of discussions you mentioned that the said that the above referred original letter had not been seen by you. (a) NCCF had to just forward the Forms along with certified copy of Form 3 A of each employee from 1995 onward till the year of retirement. (b) There was no financial involvement of NCCF. ( c) Hard Copies of the year wise Form 3 A”s were available in office in bound Form as the undersigned ,as also, my predecessors during the course of service had forwarded the same to the EPFO every year for issuance of balance slips. Hard Copies were retained for giving clarification, if any, on the queries raised by employees or EPFO. (d) Soft copies of the same were available in form of back up on CD’s as also the PF program on which they were generated. (e) EPFO would take further action only on receipt of the data from NCCF. (g) It was also suggested that in case additional manpower was required for the work, the Ex Employees would readily offer their services “FREE OF COST’. (f) There had been a delay for period of almost 5 months due to the inaction of the office which was causing anxiety among the Ex Employees scattered all over India. On your assurance that action would taken we requested you once again to kindly issue necessary instructions for getting the work done. 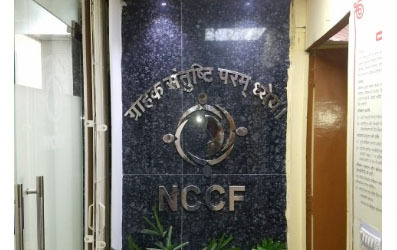 After visiting you , my Ex colleagues also met the Manager Accounts and the following startling facts emerged which give rise to doubts that the inaction of the part of NCCF was deliberate and could be with the intention to harass the ex employees with ulterior motives . Ø The above referred letter of EPFO dated 10.05.2018 stated as not seen was received in NCCF on 14.05.2018 by speed post and duly entered in the inward dak register. Ø Inspite of the fact the said letter dated 10.05.2018 was received as also a photocopy of the same along with all the relevant correspondence being submitted to office on 24.05.2018 along with a request to forward the same no coginance was taken for it. Ø A letter dated 25.05.2018 was issued to EPFO requesting them for same instructions which were communicated by them in the letter dated 10.05.2018. Ø It may be pertinent to state here that as no mention of the availability of record has been made in the two letters sent to EPFO by NCCF , the delay is deliberate inspite of availability of record as apprised to in the meeting held on 5.06.2018. Ø This letter of NCCF dated 25.05.2018 was hand delivered to EPFO on 30.05.2018, which clearly appears to be an afterthought to mask the dubious intentions when the facts stated above are linked. Thus I and on behalf of all my Ex colleagues who have superannuated from the services of NCCF and have submitted their forms for revision of pension. request you to kindly issue necessary instructions for forwarding the Forms to the EPFO without any further delay. Further to the best of my knowledge no acknowledgment has been issued by NCCF intimating the receipt of the Forms. In order to avoid the repetition of fate of EPFO letter dated 10.05.2018 , it is suggested that a list of employees may be posted on the website which may be periodically updated so that the Ex Employees (most of them being from outside Delhi) are assured of the receipt of the same by NCCF. Receipt of the mail may kindly be acknowledged and action taken in the matter intimated. AS NO RESPONSE HAS BEEN RECEIVED ON THE ACTION TAKEN EITHER IN HARD COPY FORM OF EMAIL , I AND ON BEHALF OF ALL MY EX COLLEAGUES REQUEST YOU TO KINDLY TAKE UP THE MATTER WITH NCCF FOR ACTION IN THE MATTER. Getting a very meagure amount of pension during these hard days of crisis. I sent a letter to MD, NCCF during April 2018. But no fruitful result has yet to come. I would earnestly request MD to take suitable action so that our finacial hardship will overcome. I retired from the service of NCCF on 31.12.2009. Mr. Malla Jagadish, a representative of employees in the Central Board of Trustees (EPF) saw my post in my exclusive group “EPS 95 Sewa Group” on facebook created for the welfare of EPS’95 pensioners and as desired by him, a copy has also been emailed to him for taking-up the matter appropriately. We must appreciate his self initiative & gesture towards EPS’95 pensioners as he himself asked me to email the details to him for taking up the matter appropriately. My SEWA group has (till now) 39,741 members which include retired judges, Retired/Serving RPFCs/Officers/Officials of EPFO, members of the CBT (EPF) and EPS’95 pensioners settled across the world and all cities in India. You all may also join this exclusive group for getting updates on the burning issue i.e. revision of EPS pension on actual salary as per Apex Court judgment. You all can also contact me at any time for any assistance 24×7. The web link of the group is being shared and the button JOIN has to be pressed for joining the same. Sir ,Thanks for your kind support. We will get our right with your support. We are in a embarrassing situation as NCCF official is not supporting the retired NCCF emoloyees and Thank you S.N singh jii for leading us for this movement as we are suffering a lot. Good to see here that NCCF management actually ………..Redefines the MEANING of SO CALLED ” COOPERATIVE ” and the way they are cooperating the ex-employees, of NCCF is Mind Blowing……… The Next Generations NEVER Trust these kind cooperatives and their COOPERATORS — What Example they are trying to set in front of coming generations about Cooperatives……… JUST MONEY MAKING INSTITUTIONS for some limited people on the top posts…..NOW IT SHOULD STOP otherwise it’s too late for COOPERATIVES to survive, Kindly elect Good people from Crowd,, not the POLITICIANS and keep on changing them after a certain interval. Here all Ex-employees should join your hands together to firmly fight for their RIGHT and let your SOUND Should Reach to the ears of the PRESIDENT, PRIME MINISTER as well regarding this BIG Bhrastachar. NCCF retired persons have given major portion of their life in the development of NCCF. But NCCF management is not honoured the respect of these Ex employees.They are behaving like the material which used and then thrown in dustbin.. They should think that they will be retired. Thanks to Sri S.N. Singh for encouragble steps. I submitted my application along with prescribed format with Nccf on 8.1.18 .after that I visited 4 times and met MD and Shri S. C. Guptaji and also sent 4 reminders. Till date no action has been taken by NCCF Inspite of instructions recd from EPFO deptt.neither Nccf forwarding my application to epfo nor intimating to me anything and therefore harassing Me in the old age. want to throw light on this serious matter, as we all know that 200 retired employees are suffering from above mentioned to NCCF management (including – Manager Finance S C Gupta)with all the miseries & struggle. there are blind retired employees, 10-15 widows, 4-5 retired employees are passed away with keeping hope of having increased pension. Even after having a brief discussion with MD – Shaukat Ali, ex-MD Kamal Chaudhary & Ex-MD Anil Bahuguna, who actually assured us to have our applications processed however on discussion with Manager Finance Mr. S C Gupta – it seems he’s detaining pension documents of retried 200 pensioners with malafide intentions, also its a very painful to say in this age & had a respected carrier & post we are also getting harassed by Mr. Gupta-he shouted & scolded a few of us-requesting for processing of increased pension. It seems also disrespecting Hon’ble Supreme Court verdict. we request to Mr. Shaukat Ali to take necessary action aganist S C Gupta. Also request you to please get the new increased\higher pension executed as you also know it been more than 8 months, 100 of us are actually struggling, we are visiting & requesting NCCF several times. Thank you Sharma Ji for the initiative, and taking up the matter with the department concerned/NCCF for pensioners. Thank you Sharma Ji for taking the initiative, and taking up the matter with the department. Even after discussion with higher officials it seems that HO is no way interested to take any serious action of these retired employees. People like us, away from Delhi it is difficult meet or contact each and every person. Thank you all staff members, especially Sharma Saab for the initiative taking up the matter. Requesting NCCF Management to initiate quick appropriate action on this score. Requesting NCCF Management to take appropriate action as early as possible on this score . We convey our sincere thanks to Indian Cooperative for taking up the grievance of more than 200 ex-employees of NCCF in respect of their higher pension payable in the wake of decision of the Apex Court, New Delhi. “We inform with great pain that inspite of number of personal visits to the concerned officials of NCCF for submission of subject cited details, but regret to say that till today no positive action seems to be taken by the officials. During the course of discussion, it was also purposed that some Ex-employee are ready to render, their free services for submission of aforesaid details but the request has been turned down. Further it has also been gathered that M/s. Sigma Automation (Ex IT Consultant of NCCF) is ready to provide entire data at a very nominal fees, even that the same has not been considered by the concerned official. We all Ex-employee are ready to bear that nominal fee, in case NCCF is not in a position to bear this nominal expenses for their Ex-employees. The data to be filled in Form-3A are already available (i.e basic pay & DA of Ex-employees) with the accounts department Head Office. The same data could also be available with the Gratuity Trust, who submits the same data to LIC on yearly basis. We do hope that “Indian Cooperative” will continue their support to take the grievances of employees/ex-employees of the cooperative sector always. Thanks, Sharma Sir, Sunilji, Kakariaji & Kohliji for the Day to day information/development. We are ready to cooperate as suggested. I am retired from the services of NCCF ON 31-8-2016, and submitted my application on prescribed format on 11-1-2018 simultaniously I,visited 3 times met the then MD and Sh.S.C Guptaji and also sent 3 reminders.But till today no action has been taken by NCCF inspite of instruction received from EPFO office. NCCF neither forwarding our 200 pensioner”s application to EPFO nor intimating to us for reason behind.We all ex-employees of NCCF have given major portion of life for betterment/ of NCCF but NCCF management is not honoured. i am also submitting my applicatoin on prescribed format as well as met MD and Sh S.C. Gupta personally 3times but no action has been taken inspite of instruction received from EPFO Office They are not responding our letters nor given any reply for the reason behind.We all 200 Ex Employees given our major portion of our life for betterment of NCCF. At the first instance, the NCCF has harassed a number of retired employees by withholding their legitimate retirement benefits after superannuation from service on flimsy grounds for years together. Many retirees have knocked Judiciary in different parts of the Country to get their retirement benefits on no fault of theirs by incurring huge legal expenses and ultimately NCCF was forced to pay such dues with interest as per the orders of the Courts. Few cases are still pending before the Court. There are instances of such cases where the settlement has not been made fully to the ex-employees even after 10 years. At this moment, the revised pension issue has emerged which is causing financial hardships to the retirees on account of NCCF’s non-cooperative attitude. While the EPFO urged upon their Regional Field offices in the Country vide its circular dated 23.03.2017 & now again on 08.06.2018 to honour the spirit of the Hon’ble Apex Court order dated 04.10.2016 in the matter of revised pension, as to why the current officers in NCCF are shying away from the responsibilities in providing required data to Regional EPFO enabling to calculate the revised pension and arrears thereof, is a matter of great concern which may ultimately lead to Contempt of Supreme Court under Section 2(b) of Contempt of Court Act, 1971. An iron hand is very much necessary at Ministerial level to mend NCCF’s ways of functioning & handling such vital issues, before the matter goes out of hands. Early action at MD’s level will be of immense help for the benefit of retirees, few of them are widows / widowers. The question now remains who is to bell the cat. plz saw this case & solve A.S.A.P.ex employee given our whole life to betterment of NCCF ..so plz as request to increase our pension .